Android mobile apps are the software applications, which are created to run on an android based operating system on smartphones, tablets and mobile devices. Through the Google app stores, mobile apps are available for download on android mobiles. 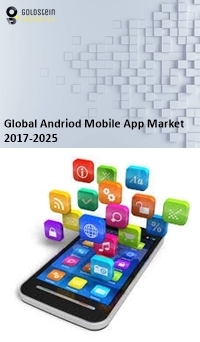 The rising rate of mobile phones penetration and internet connectivity are majorly driving the growth of global android mobile apps market. On Google play store 70% of the apps are available to download for free. More the number of applications downloaded will generate higher revenues for the app developers and the Google app stores. Gaming applications had the largest contribution in the global Android mobile apps market revenues in 2017. On the Android platform, Candy Crush Saga gaming app recorded the largest revenue share in 2017, generating USD 53.49 million. Globally consumer spending on all platforms mobile apps has doubled over the past two years, reaching nearly USD 86 billion at the end of 2017. But Android apps download grew at a faster rate as compared to iPhone i.e. at a rate of 16.7% and 6% respectively in 2017. Top countries with highest app download customers were from China (leading the market), followed by the U.S., India, Brazil, and Russia. Moreover, the subsidized internet available to the app users such as in India by Reliance Jio had a huge impact on the growth of the market. Goldstein Research analyst forecast that the Global android mobile apps market is set to reach nearly USD 337.5 billion by 2024, growing at a CAGR of 15.6% over the forecast period (2017-2025). Gaming applications accounted for the largest market share of 73.4% in 2017 owing to its highest number of downloads. Gaming applications are closely followed by social media and entertainment applications. Based on geography, Asia-Pacific dominated the global android mobile apps market share in 2017, accounted for 43.1% with China, India, Indonesia and South Korea being the top contributors. APAC is followed by North America, with the major share being taken by the United States, and over the forecast period, U.S. android mobile apps market is expected to grow at a CAGR of 17.8% on account of market maturing in terms of app usage. The report covers the present ground scenario and the future growth prospects of the Android mobile apps market for 2017-2025 along with the market players’ analysis. We calculated the market size and revenue share on the basis of revenue generated from major players in the Global region. Global Android Mobile Apps Market Outlook 2017-2025, has been prepared based on an in-depth market analysis from industry experts. The report covers the competitive landscape and current position of major players in the Global android mobile apps market space. The report also includes Porter's five force model, SWOT analysis, company profiling, business strategies of market players and their business models. “Global Android Mobile Apps Market Report” also recognizes value chain analysis to understand the cost differentiation, pricing models to provide the competitive advantage to the existing and new entry players. Our Global android mobile apps market report comprises of the following companies as the key players: Google Inc., Microsoft, CA Technologies, Cognizant, SAP SE, Samsung Electronics Co. Ltd., China Mobile Limited, Apple Inc., Opera Software, LeewayHertz, Apptology, Zymr, Chelsea Apps Factory, Reliant Tekk, Fan Studio, IntellectSoft, Mentormate, Infinum, etc.